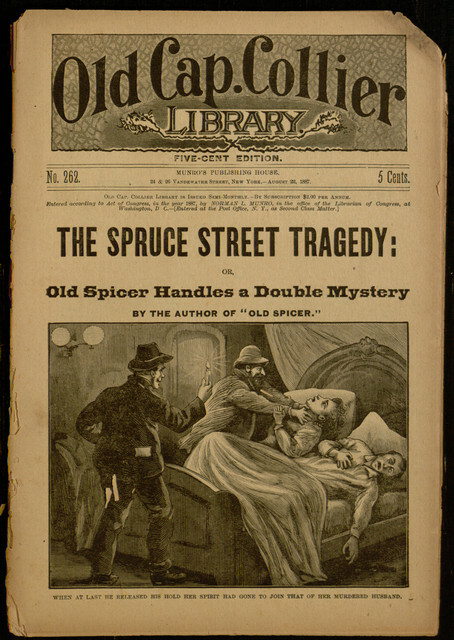 Our latest completed Project Gutenberg eBook is The Spruce Street Tragedy; or, Old Spicer Handles a Double Mystery, part of the Old Cap. 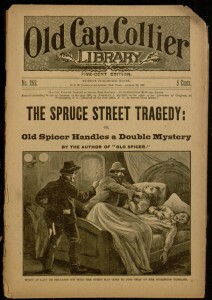 Collier Library of detective-themed dime novels, and one of several titles featuring tall, thin, aging Mark Spicer as the hero. Dime novel detective stories tended to focus less on mystery than on action. This was likely a practical matter, given the speed at which dime novels were usually written; it is far easier to write a series of chase scenes and fights than to devise a puzzle for the reader to unravel. Old Spicer gave him a hurried but plausible explanation. The key was at once handed to him. The reader is never filled in on the details of this “plausible explanation,” likely because the author didn’t have time to come up with them. If the book has any redeeming feature, it may be the publisher’s catalog at the back, which advertises an astonishing range of bizarre-sounding detective adventures. While it is very likely that none of them are much better than this tale, it’s still hard to resist learning more about such heroes as Old Humpey, the Dwarf Detective or Zeb Taylor, the Puritan Detective! The entire book (including the catalog) can now be found at Project Gutenberg, where it can be read online or downloaded in a variety of popular electronic formats.